Two Tickets For...: Sarah Wishes We Had a Housekeeper Like This: Our Review of "Safe House"
Sarah Wishes We Had a Housekeeper Like This: Our Review of "Safe House"
Synopsis: Fledging C.I.A. agent Matt Weston (Reynolds) is unhappy with his job as a Cape Town safe house "housekeeper" until a notorious former C.I.A. agent turns himself in and is brought to his safe house for interrogation. When a bunch of guys with guns break into the safe house to kidnap Frost, all hell breaks lose. Andrew: Hello readers! 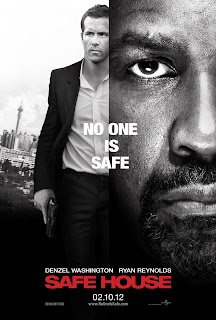 Tonight my lovely wife and I caught a late matinee showing of “Safe House” starring Denzel Washington and Ryan Reynolds. Last Thursday in our weekly preview I mentioned how I thought it looked like a Tony Scott-like thriller, and I think that’s exactly what we got. What were your impressions on “Safe House,” Sarah? Sarah: Well first of all let me just say that Denzel Washington is just fun to watch act. He’s got so much talent. And Ryan Reynolds isn’t far behind him in the acting field. This movie was fun. It didn’t try to be anything it wasn’t and was action-packed. I know you feel similar about some of what I said, but what else did you think about it? A: I thought “Safe House” was a pretty good action flick, overall, but if we’re being honest then I have to say it’s uneven. There are parts of the film that are pretty exciting and riveting, particularly the actual safe house scene you see in the trailer and a chase through a tin shack village. But then there are plenty of scenes where the pace slows down considerably. And there’s a common denominator with the slower scenes, and that’s that Denzel isn’t in those scenes. S: I can see where you would think that, but then again it wasn’t like they wanted the movie to be the next ‘best action film.’ I liked the simplicity of the movie. Now down to details. I liked how the scenes were shot. It was gritty, and since the movie takes place in South Africa, the shots really felt natural. A: I completely concur with you on that point; the film really does look good. The color palette makes the South African locale seem dirty and hot. It also has a grainy and shaky look to it that totally works. (Again, like a Tony Scott film.) I particularly liked how they shot the hand-to-hand combat. You could actually see the punches landing. It will sound cliche but they felt like the Bourne movies at those times. But if you don’t mind, I’d like to go back to my point about Denzel real quick. This film is at it’s absolute best when Denzel is on the screen. I don’t think I can pin-point what it is exactly, but it’s definitely a combination of his smile, that wry look in his eyes that tells you his Tobin Frost is a guy who knows exactly what he’s doing, and just how he carries himself overall. 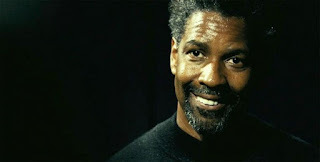 I’m a big fan of Ryan Reynolds, and I think he does a good job in “Safe House,” but I do think the movie should have focused on Frost more simply because of how energetic Denzel is. S: Ok, I’ll give you that. But I do think that Reynolds did just as good of job as Washington. Denzel is a powerful presence, and he’s proven many times over that he’s a great actor, but I think that Ryan held his own. I think that they made a good pair. What did you think about the other big names in the movie (Vera Farmiga, Brendan Gleeson)? A: I thought the other players did well. Gleeson probably had the third biggest role in the film as Reynolds’ immediate C.I.A. supervisor. But they really didn’t have too much to do in the film other than to help the exposition. Why, what did you think of them? S: I liked them, but I wasn’t sure they were necessary. They weren’t in it enough to make it worth it to me, but oh well, I’m sure they have already been paid. Next time. A: Exactly what I mean – they didn’t serve a purpose other than to help move the story forward. Obviously that’s needed for films, but I think it was a little obvious this time. S: It’s a great way to kill an afternoon!